Bob Baffert knows from success in Triple Crown races. Making the Grade, which will run through the 2014 Belmont Stakes, focuses on the winners of the big races, usually from the previous weekend, who could impact the next Triple Crown. We’ll be taking a close look at impressive winners and evaluating their chances to win classic races based upon ability, running style, connections (owner, trainer, jockey) and pedigree. This week we take a closer look at Hoppertunity, winner of the Grade 2 Rebel Stakes on March 15 at Oaklawn Park. Hoppertunity was fast, we knew that much heading into the $600,000 Rebel Stakes on March 15, but could he ace a class test in his second graded stakes race? In his first try in the Grade 2 Risen Star Stakes on Feb. 22, Hoppertunity was wide throughout – really wide – and finished a well-beaten fourth. In the Rebel, he faced highly regarded multiple graded stakes winner Tapiture and Grade 1 winner Strong Mandate and outfinished both of them to punch his ticket to the Kentucky Derby on May 3. Ability: Hoppertunity gave Hall of Fame trainer Bob Baffert his fourth Rebel Stakes winner in the last five years and posted a new career-best Equibase Speed Figure of 105. There was some jostling and bumping in the stretch, but after the roughly run final three-sixteenths of a mile or so, a claim of foul and a stewards’ inquiry, Hoppertunity’s victory became official as did his chances as a Kentucky Derby contender. The 50 points he earned guarantees Hoppertunity a spot in the starting gate, but he showed both ability and resilience in the stretch of the Rebel. Near the top of the stretch, Hoppertunity rallied right alongside Strong Mandate, leaving Tapiture nowhere to run. These were strong race-riding tactics from Hall of Famer Mike Smith, for sure, but completely within the rules and an attempt to give his mount the best chance to win. Tapiture forced his way between the two, initiating the first contact in the stretch, but Hoppertunity did not shy away and battled on bravely. There was additional contact later in the stretch, but Hoppertunity would not be denied and edged away to win by a half-length for his second win in four starts. Hoppertunity did not race as a 2-year-old, something we are seeing from quite a few Derby hopefuls this year, and finished fifth in that Jan. 4 race before a three-length romp at a mile on Jan. 30 at Santa Anita Park. The Any Given Saturday colt, a $300,000 purchase at the 2012 Keeneland September yearling sale, earned a 100 Equibase Speed Figure for his first career win and a shot in the Risen Star. Hoppertunity was so wide throughout that he probably ran an extra sixteenth of a mile in the Risen Star – and that’s only a slight exaggeration – so the fact that he finished reasonably well for fourth was more cause for optimism that his getting beat by seven lengths was a cause for concern. He showed his real talent in the Rebel Stakes with his second triple-digit speed figure in three starts, and next we’ll see if his ability is enough to overcome his lack of foundation with no races until this year. Running style: In two of his three starts, Hoppertunity has dropped well back early and rallied late. 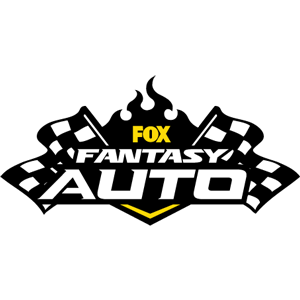 In his other two races, he was up close to the pace early and in ideal striking distance at the top of the stretch. Guess which two races he won. I think it’s safe to say that Hoppertunity is a much more dangerous horse when he is engaged early and allowed to use his speed to gain tactical position. I’d look for him to stalk the leaders in his next couple of races and try to uncoil his powerful, late stride before the closers and the deep closers. 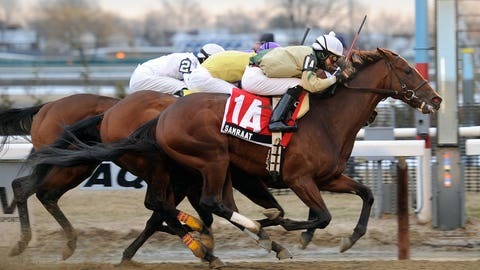 That type of tactic is especially effective in the Kentucky Derby and Preakness, but it’s also one that about half of the field for the Derby will be attempting to employ. We know Hoppertunity won’t be bullied but we also know that ground loss can be a major detriment in big races. 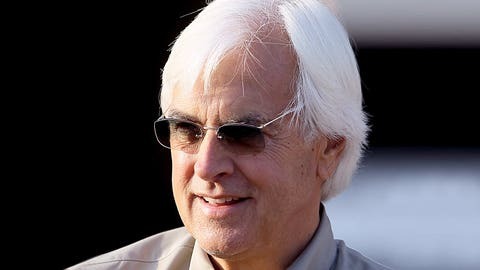 Connections: Hall of Fame trainer Bob Baffert has won the Kentucky Derby three times (Silver Charm , Real Quiet , War Emblem ); the Preakness Stakes five times (Silver Charm , Real Quiet , Point Given , War Emblem , Lookin At Lucky ); and the Belmont Stakes once (Point Given ). Baffert knows how to get a 3-year-old ready for a big race. Arizona businessmen Karl Watson, Mike Pegram and Paul Weitman have been partners in a number of horses trained by Baffert. Watson and Weitman own a number of car dealerships in Arizona, and Pegram owns more than 20 McDonald’s restaurants in Arizona and is a partner in casinos in Reno, Nev. The trio’s first horse together was Eclipse Award-winning sprinter Midnight Lute and they also raced Lookin At Lucky, who won the 2010 Preakness. Other notable runners owned by Pegram include Hall of Famer Silverbulletday, Kentucky Derby and Preakness winner Real Quiet, and Dubai World Cup winner Captain Steve. Hall of Fame jockey Mike Smith won the Kentucky Derby in 2005 with Giacomo and has finished second in the Derby four times. He rode Hoppertunity for the first time in the Rebel. A respected big-money rider, Smith is the all-time leading Breeders’ Cup jockey with 20 wins. Pedigree: Hoppertunity is from the fourth crop of 2007 Haskell Invitational Stakes winner Any Given Saturday, who has sired 11 stakes winners through March 17 but is still looking for a breakout star in the U.S. This bay colt gets a nice jolt of class from the maternal half of his pedigree. He is a half-brother (same dam [mother], different sire [father]) to two-time Grade 1 winner Executiveprivilege. Hoppertunity is one of eight winners from as many starters out of the Unaccounted For mare Refugee, who finished third in the Grade 2 Orchid Handicap in 2002. Executiveprivilege won the Grade 1 Chandelier Stakes at 1 1/16 miles in 2012, while Refugee was beaten by less than a length on the grass in the 1½-mile Orchid. The most interesting name in Hoppertunity’s pedigree, however, is undoubtedly his third dam (maternal great-grandmother), Davona Dale. A 1985 inductee into the Racing Hall of Fame, Davona Dale strung together eight straight wins in 1979 en route to the Eclipse Award as champion 3-year-old filly. Among the wins during the streak were the Grade 1 Fantasy Stakes, Kentucky Oaks, Acorn Stakes, Mother Goose Stakes and Coaching Club American Oaks as well as the Grade 2 Black-Eyed Susan. A stakes winner from three-quarters of a mile to 1½ miles, Davona Dale was one special filly. I don’t know how much having Davona Dale as his third dam will help Hoppertunity in the stretch of the Kentucky Derby with an eighth of a mile to run, but it can’t hurt. It’s also nice to see his dam already has produced a multiple Grade 1 winner and showed some class herself on the racetrack going 1 ½ miles against elite competition. As we saw in the Rebel, there is a lot to like in Hoppertunity … and there might be even better races to come from this talented colt.